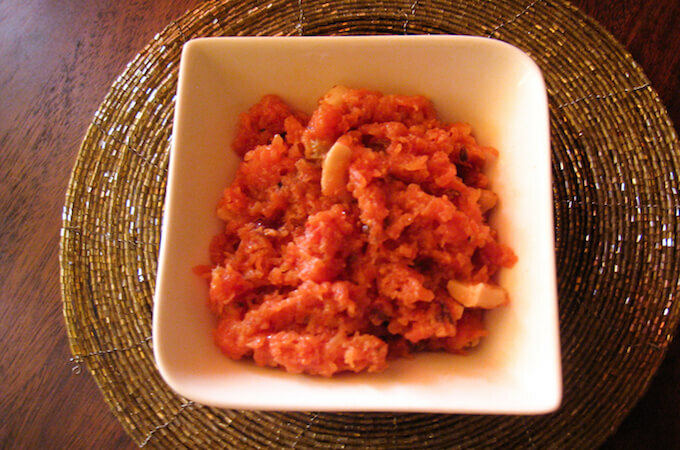 Gajar halwa is a carrot pudding, traditionally made by cooking grated carrots in milk and sugar. Khajoor gajar halwa is delicious, naturally sweet and low in sugar. Here I have used both dates and sugar, but you can just increase the number of dates to make sugar-free gajar halwa. Gajar halwa is a quintessential winter dessert in every Indian household. I have memories of a bowl of carrot halwa on the dining table all through carrot season. We used to eat small quantities of it at almost all meal times 🙂 I am not as loving and caring as my mom to maintain a steady supply of carrot halwa in the home but I still do make it quite often as it happens to be Sikander’s favorite of all desserts along with moong dal halwa. As often as gajar ka halwa is made in winters, I wanted to try a recipe with less sugar. I saw this idea on Sanjeev Kapoor’s column in our daily newspaper. Dates or khajoor are natural sweeteners and a healthy substitute for sugar in most traditional Indian sweets. Just soak regular dates in hot water until they are soft. De-seed and chop or make a paste. In most recipes date paste can be used in a 1:1 ratio to substitute for sugar. Since this was the first time I was trying to make a halwa with dates, I replaced ¾th of the sugar with dates. But next time I am going to make a completely sugar-free gajar halwa with just dates and no sugar. Somehow in winters, we do end up eating a lot of sweets and in our minds, we convince ourselves that it is all getting burned up to warm the body… I secretly do believe it, which is why I keep cooking so many dessert recipes :-D. Substituting sugar with dates is a great way of making sure, we can continue to enjoy them guilt-free. 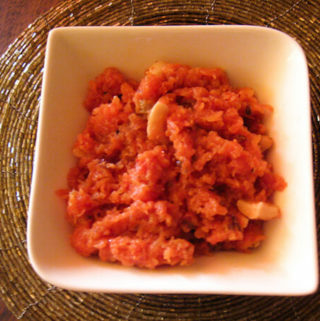 Low-sugar gajar halwa recipe with dates in place of sugar. Dates are a great natural substitute for sugar in traditional Indian dessert recipes. Here I have used both dates and sugar, but you can just increase the number of dates to make sugar-free gajar halwa. Heat ghee in a kadhai or thick bottomed pan. Add cashew nuts and lightly roast them for a minute or two. Remove the cashew nuts and keep aside. In the same pot, add the grated carrots and sugar. Mix well and cook for about 5 mins. Add milk and continue to cook on medium flame for another 15 mins till there is a boil in the milk and the milk starts to reduce. Add dates, raisins, cardamom powder and mix. Cook for another 10 minutes with occasional stirring until all the milk has evaporated and the carrot halwa is thick. Traditionally full-fat milk and ghee are used in the recipe, but for a low-calorie halwa, you can skip the ghee and use low-fat milk. .
Gajar ka halwa can be stored for up to a week in the refrigerator. 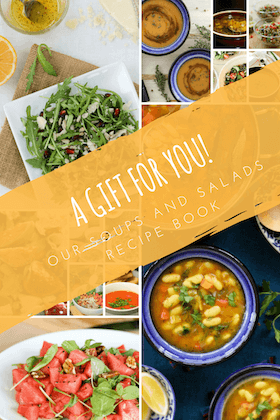 Make a big batch and enjoy! I m on diet and I always crave for sweets, ur recipe seems to be a blessing will try it today itself. I sure hope you enjoy some of these sweets which are naturally sweetened with dates! If you would like, also check out my sugar-free dates and vermicelli kheer. It is made with soy milk and uses only dates for sweetening.